Hello friends! 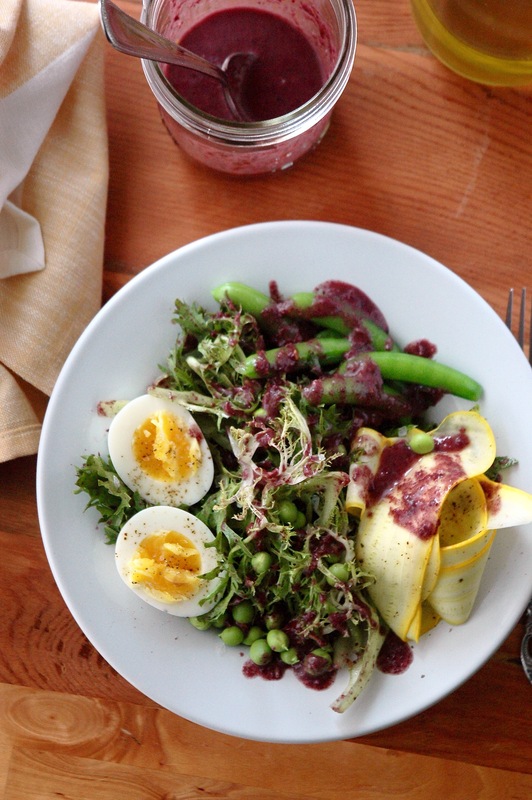 Welcome to my new favorite salad dressing topping: Kalamata Olive Dressing. It’s made from simple pantry staples (as always, that’s a must!) so you can whip it up nice and quick and slather it on anything from salad greens to roasted potatoes to bread to etc. etc. If you’re not a fan of Kalamatas, you may want to pass on this recipe because IT.IS.KALAMATA.FORWARD. If you’re still interested in making a dressing from olives and other briny bits (like capers! ), just use your favorite mix (& make sure they’re all pitted! <— most important detail). Kalamata olives are my go-to choice at the store. I bring my own pint jar and fill it up at the olive bar (Thank you, Ballard Market!). I use Kalamatas in salads, pastas, sauces, on pizza! and now in our new favorite dressing. Look at that rich and beautiful burgundy color up ^ there! Dies. We both love this salad dressing and I’ve been making it for a few weeks now. I use a hand blender and blitz it directly in a wide-mouth canning jar (so it’s easy to store any leftover dressing). Does anyone else make their dressings this way? 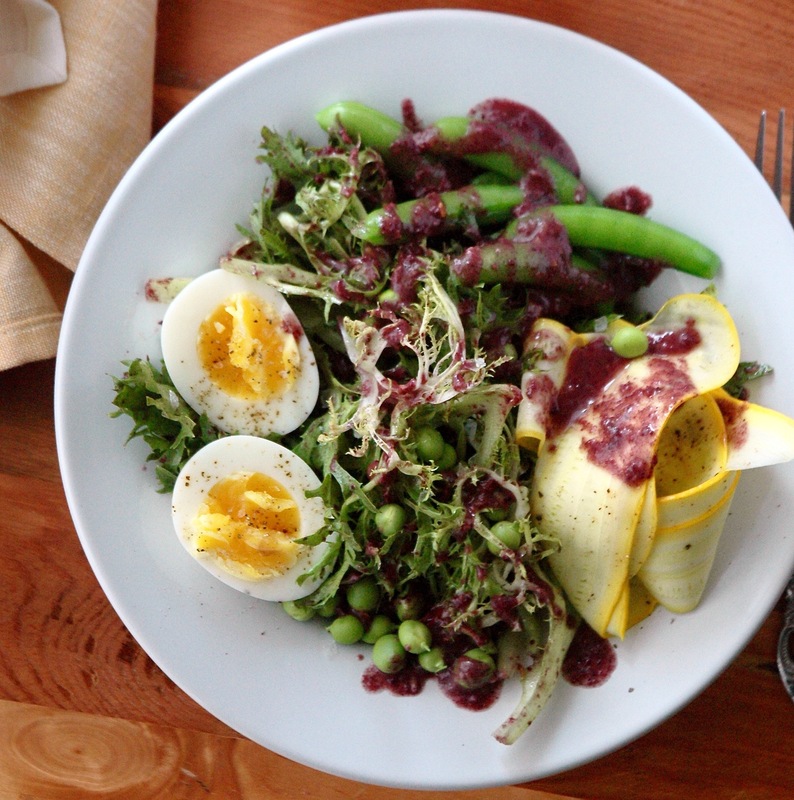 The salad is simple, and really holds up nicely to the thick salty tangy Kalamata dressing: fresh frisée, simple blanched Spring peas, an “8-minute” egg and some thinly shaved zucchini (first I’ve seen at the farmers market!). 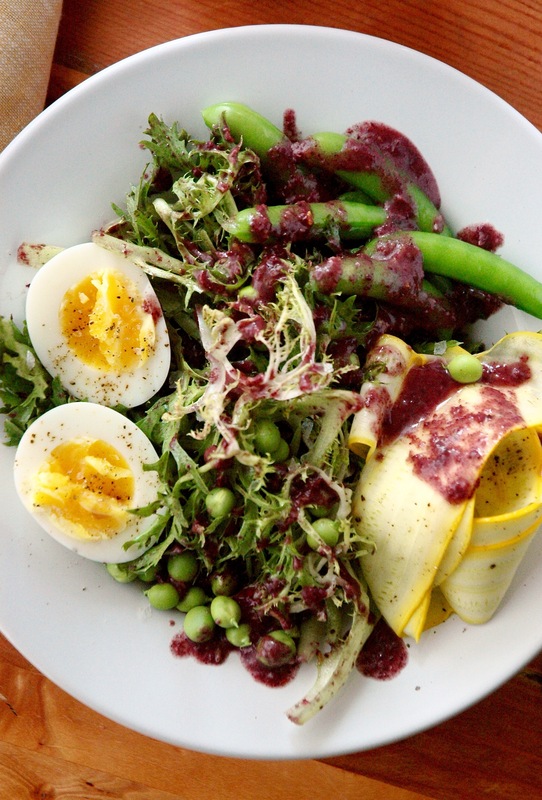 A simple yet satisfying meal-sized salad featuring farm fresh frisée, tender Spring peas, medium-boiled eggs and a uniquely briny, tangy Kalamata olive dressing. Pair with a slice of your favorite fresh bread and enjoy! Bring a medium sauce pan with salted water to a boil over high heat. Set a bowl with an ice bath next to the pot. Blanch snow peas for about 40 seconds, until bright green and just barely tender. Remove from water with a slotted spoon or spider strainer and plunge into ice bath. Once cooled, remove from the bowl and set aside to dry. In the same pot of boiling water, add your eggs* and cook for 8 minutes. Remove and plunge into ice bath, cracking the shells slightly. Peel when cool enough, and set aside in the fridge to chill (you can also leave them at room temp if you prefer). 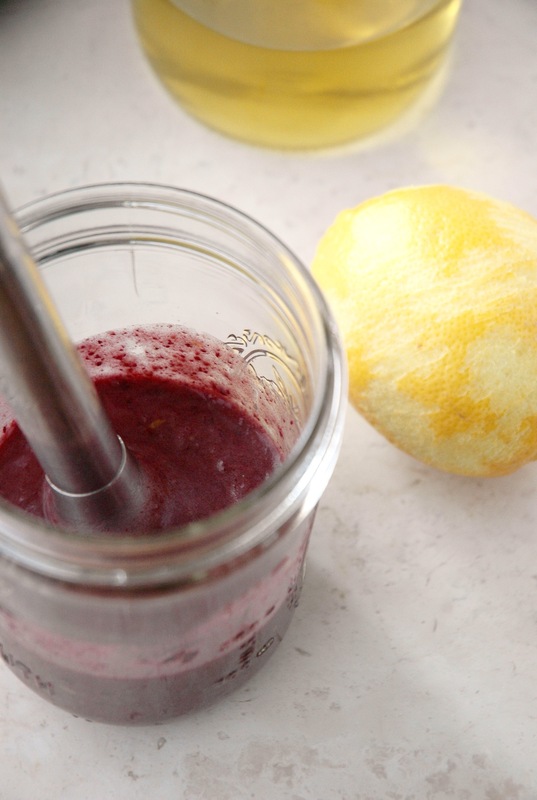 Blend all the dressing ingredients together in a small jar with a hand blender until smooth but still slightly chunky. Taste test and adjust seasoning as necessary. Add a bit of water if the dressing is too thick. Toss the frisée with about 2 tbsp dressing and portion onto plates. Cut eggs in half and place 2 halves on each plate. Assemble the rest of the ingredients on the plate (you can toss everything together if you want, I like to do mine deconstructed). Drizzle more dressing over the whole plate. Top with flaked sea salt and fresh cracked black pepper as desired. *I use this lovely mint-green mandolin to get my zucchini ribbons evenly paper-thin. *I place my eggs into the boiling water with this handy spider strainer. Nick and I escaped to Orcas Island, WA for Memorial Day Weekend, so you can certainly expect a lengthy, somewhat belated post with lots of scenic photos very, very soon! Stay tuned.